One of the Valley’s best kept secrets, this lovely home is tucked in the trees on the edge of the Monongahela National Forest. Centrally located the house is just minutes from the center of the Valley…or the town of Davis. Whatever way you want to go, Perfect Ten provides a super spot for friends and families to gather. Gather around the lovely stone fireplace for movies and merriment…send the kids to the game room for a game of pool…relax and enjoy. Family meals are easy to prepare in the fully-equipped kitchen with plenty of space to dine outside. Unwind in the outdoor hot tub in every season while summer visitors can enjoy the community pool and tennis court. Perfect 10 is an ideal vacation space at a very affordable rate. Winter visitors will need to plan on 4-wheel drive vehicles. My family and I met here from three different states as a nice “meet in the middle” location. The house was very clean and had pretty much everything we needed for our stay. We cooked all our own food and found the kitchen to be stocked nicely with pots and pans. The home had plenty of space and a huge dining stable which was perfect for us as we like to play games together. The front porch was simply amazing and we enjoyed our time outside. We used the charcoal grill and hot tub and had no issues. The fireplace is wood burning and easy to use. I would recommend this home to any big family that is looking for some down time and quality family togetherness. This was our second stay at Perfect 10. Plenty of space for our crew and the kids loved the game room. Many thanks to Best of Canaan for a great property and wonderful staff. The house worked out and would stay there again but it needs some work. Couple things to note was the fridge door does not seal unless you push it close really hard. Their was garbage and trash under the couch and upstairs bed. Half the light bulbs were blown out. The kitchen cupboards doors hinges are messed up. The best compliment we can give is we stayed here last year and loved it so much we came back this year! The game room is stocked with toys, games, and a pool table, DVDs...hot tub on porch....swimming pool a 3 minute walk...many rooms to explore...beautiful scenery...there’s enough here to keep a family occupied without ever leaving the premises! The house was just the right size for are family. The 4 bedrooms easily provided plenty of comfortable beds. The kitchen was well equipped. The was an issue with the refrigerator door. It was very hard to keep shut. Everything in the house worked the way it should. Awesome house in an AMAZING area of WV! This house was perfect!! We had 3 families come in from across the country to meet up here & it was a perfect fit! The hot tub was great, but the game room really topped it off!! Our boys ended each day of hiking, fishing & biking with games (while the adults were able to talk over cocktails downstairs)! We will be renting here again for sure! Thank you Perfect 10!! In general, we really liked the house and its location. Pros: large deck with a beautiful view for relaxing and barbeque, games room with a pool table, hot tub, access to swimming pool, large dining table good for 8-10 people. Cons: there was almost no lights for the outdoor hot tub, sheets didn’t seem clean and there were worn, the dryer didn’t work, refrigerator door didn’t shut tightly, some of cupboard doors were off hinges, electronics were way outdated, not enough paper towels/toilet papers for three nights stay, not enough spices in the kitchen (for example there was no salt! ), not enough trash bags, no liquid soap in the bathrooms. Reasonably priced, good location, lots of games/activities provided. My family had a great time and will return. My family and our friends with all our children vacationed in "A Perfect 10" this past weekend. We had a fantastic time in the cabin and Canaan Valley area. Cabin was nice and roomy, kids loved the game room, kitchen was well equipped. Lovely time had by all! A beautiful fall weekend in W. Va.
We rented "Perfect Ten" near Davis, W. VA. and Blackwater Falls State Park. The house was comfortable, clean and well stocked with necessary equipment. It sleeps ten and has three full bathrooms, a nice kitchen, plenty of televisions, a pool table and a hot tub. We had a great week in the summer with a group of 10 people (6 adults and 4 children). This house worked perfectly for us. The children could go play above the garage while the parents drank coffee on the porch. The house was clean and in pretty good condition. There were some wear and tear that is generally associated with a rental property, but this was nothing to complain about. We loved it and would definitely rent from Best of Canaan again. We chose this place as it had something. on everyone's list. The covered porch was great for family meals and relaxing. The hot tub was perfect after a day of outdoor exploration. We enjoyed the community pool which was clean and refreshing on a hot summer day. The game room,was a fun place. The main level restroom could only be accessed through a bedroom. If your group is not related it may be a little awkward. We loved the privacy, outstanding views from the house and convenience to local attractions. The general condition was very clean but lacked some general maintenance. We called Best of Canaan to report the ceiling fan and light not working, the pool sticks were missing tips and the kitchen cabinet door fell off it's hinge when gently opened. They were extremely responsive and all these concerns were addressed in less than 24 hours. We called after business hours to report the gate code did not work and we were locked out. Donna answered the phone on the first ring and was able to give us the correct code after she contacted the owner for the new code. I was thankful I did not have to go through an answering service and happy at how quickly the situation was resolved. The bedrooms are at 3 different levels which gave some additional privacy. Overall we really enjoyed the home and our stay. We arrived in the wee hours, easily arrived at the home given the clear details from BestofCanaan. The house quickly warmed up for us to settle in for a weekend of family time.We were 7 adults(52-74) and 3 children(9-14) We enjoyed comfy beds, great gameroom (We had a pool tournament) , family games and 3 jigsaw puzzles. All games we have at home but rarely find the time for. The fireplace and hot tub were relaxing ( great snores and toasted marshmallows.) Wifi was good , great at times, but it was nice to not see the younger ines not thinking about Internet while they enjoyed the calm of the mountains. We even played basketball at the court located steps away. We have been to Canaan over 10 times and this was our favorite place. The kitchen was well equipped, the house was clean ,had a few cob webs from days empty, but even my cleaning mom found little to do and sat down for several spells .Something for everyone. We even grilled ! Each of the kids and the adults requested we rebook the same place next year. Don't beat me to it!! Four generations of my family, great grandmother to great grandson, had a wonderful time here. The house is beautiful and has plenty of room to be comfortable. Beds were a little firm for some but just fine for others. Would definately consider staying here again. The Perfect Ten exceeded our expectations for sure. The home was so spacious and the bathrooms and kitchen especially were in perfect condition. I had planned very simple meals but soon realized that I could cook almost anything in the kitchen…it was so well stocked. The house was immaculate. Bed linens and towels were plush. Hot tub was in great condition. The house feels very private and the location is perfect --- only a few miles from the grocery store, a few restaurants, Blackwater Falls, and about 30 minutes to Seneca Rocks. When I turned in the keys at checkout, I booked our stay for next year. We have 4 kids under 10 and it was the perfect getaway for us. Overall, we really liked this house. 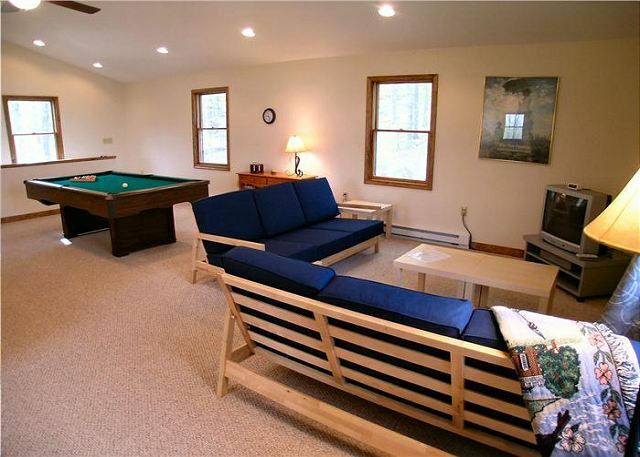 The game room was a fantastic hideaway for kids and grandpa. The hot tub was a disappointment (and comes with an additional fee) as the lights were out, and a number of jets were broken. A number of the house lightbulbs were out, but management brought us replacement bulbs. A number of the mattresses were rather uncomfortable, cupboard doors were off hinges, linens were worn, electronics outdated (although you're not there to watch TV!). The layout was conducive to a big family with a central location for Canaan activities. Our kids enjoyed the pool access. Beautiful country! Location is difficult to find on GPS. But the property management staff were the best in helping us get there! House was very roomy! We did have to change a set of sheets prior to using bed. Don't know if it was missed in last cleaning or if the sheets just happen to collect hair from washing. Ants were a little issue, but after some bug spray they weren't as bad. Hot tub needs some repair, but still a welcoming site after a long day. Updated TV would be wonderful. Either the TV is going or the cable company needs to check for a problem in the line. All in all- a very pleasant stay! Thank you! The house was fantastic! Such a perfect set up for a group! Great location, close to the ski resorts. We got a foot of snow while we were there, so we were super happy! both resorts and Davis. Plenty of space for numerous couples, or a big family. The mud room is extremely useful. My kids called it the "swag house." It is great for 2-3 families with tons of beds, a separate game room for the kids, a killer hot tub and very pretty views. Only concerns were sotty directions to the actual house - not easy to find in a small development, and could use some paper products and dishwashing supplies. But the place is well worth the rent. Great for the price, needs some updates. The house has plenty of room, and is laid out so you people aren't on top of each other. The kitchen was well stocked with cookware, and dishes. The entry way is nice and large, with seating to take your boots on and off, and hold your jackets. My complaints with the place. No flat screen/hdtv, there are only CRT tvs. I feel a flatscreen is something every house should have, this would allow people to bring their laptop, or chromecast to be able to plugin and watch netflix, without having to rely on vhs tapes that are there. 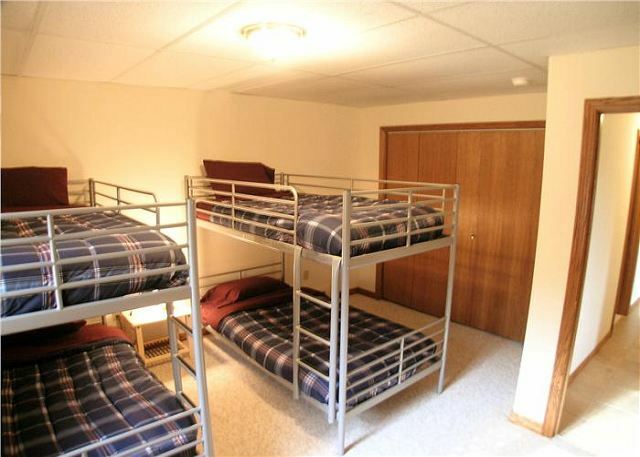 The bunk beds in the downstairs room, are children size, which wasn't noted. We had all adults with us, and it was hard for them to sleep on the beds, as they were to short, and squeaked a lot. Also, many of the mattresses were very firm, and not very comfortable. I will most likely not be staying there again as the beds doesn't suit my needs, as I don't have children, which the beds are designed for. This was the second time we rented this property. The property has a great location with spectacular views of Canaan Valley. The property does need some maintenance and upkeep. Many light bulbs were burned out, cracks in the walls need fixing, and more kitchen utensils would be nice. The office staff was very nice and the house fit us all perfectly....Great space, fireplace was awesome and the kids lOOOVED the game room! the only drawback was that there were quite a few light bulbs burnt out...including by he door to access the hot tub....would have been nice to be able to see walking to and from the hot tub. Quiet and peaceful get away! The house met my expectations. The pictures depict the house very well. The game room being overhead the garage on the opposite side of the house is great for families with kids. The house is near a lodge, about 200 yards away, but this is the reason the house has access to the pool. The pool was excellent along with the hot tub. -provide at least 1 trash bag for each day rented - making 2-3 meals a day for 8 people you need to change the trash daily. -remove the fooseball table from upstairs - its not functional and has many sharps edges and pieces falling off of it. Again - overall it was a great vacation rental, close to sights and great parks! Great location central to many activities. Big living space and large dining table make for a good hang out spot. Hot tub and multiple decks offer outdoor spots to relax. Downsides (minor): The roads are not well marked, it can be a little tricky to locate the first time. TV's are old and don't have an HDMI hookup. Overall a nice rental in good condition. We'll consider this place again when we return to Canaan Valley. The house is getting a bit worn out. the carpets and bathrooms were not as clean as our previous stays. We were extremely happy with our stay at this property. The house is in brand new condition. The kitchen was stocked well with all the items we needed. Great supply of videos and games. The property was very well-maintained. Absolutely no complaints. OH! And the staff at Best of Canaan were professional AND friendly AND helpful. Perfect Ten is a beautiful home with many amenities that made our stay very enjoyable. The pool table and game room are awesome, we spent a lot of time there. The home is very well lit and the kitchen is amply stocked with dishes, pots, pans, silverware, etc. We enjoyed keeping a fire going in the fireplace. The property management company was very responsive when we reported a broken water line. Overall, would definitely recommend this rental to a friend and we would be happy to stay here again. This is a beautiful home with many amenities that make an early season ski vacation very enjoyable. The hot tub had some problems, but the property management company was responsive to our needs. We would like to stay here again. Our family celebrated Christmas at the Perfect Ten. A very nice comfortable place, room enough to spread out but also gather together for dinner. The sunrise view is awesome! Great house for a family of 10!! The game room was a hit with the kids. This area offers lots to do in the summer months. One of the most relaxing vacations I have been on in years. We really enjoyed our trip to WV. We have seven kids, and it is not easy to find a place big enough for all of us, but Perfect 10 was. It is a beautiful home, but has some maintenance issues that need to be addressed; mostly little, like a broken cheese grater, some big, like gutters and malfunctioning exterior locks, but the house is for sale, so the owners must not be worried about it. We never asked the management to deal with the problems because they weren't worth the disruption of repairmen to us. Overall, the location is great--there are loads of things to do within an hours drive, and the scenery is beautiful. The pool at the complex is older, but well maintained. There are a lot of TVs and movies in the home, some toys, an older pool table and fusball, and plenty of room to spread out. The master has a Jacuzzi tub, which almost the whole family got a kick out of. Overall, a very nice place and stay, but I would definitely recommend to management that they try to get the owners to do a little improving. Our family of 10 thoroughly enjoyed our stay. The property was great, secluded and quiet. We loved the games room. However if you just wanted some peace and quiet there was space to retreat. We loved the pool, the tennis courts and basket ball court. The staff at Best of Canaan were very helpful. Thank you, we will definitely visit again. We immediately knew the Perfect 10 was the right felt like home and was right in the heart of one of the most beautiful places we've had the pleasure to vacation. An easy decision for our next getaway! Our family really enjoyed the space and the game room activities. The home was clean but could use some up keep, cabinet doors don't shut all the way, wall paper coming off some of the walls and water damage noted on the ceiling in the basement. These are things that were noticed but do not effect our stay. We loved the house. Perfect for 3 families with kids. The kids didn't want to leave. It had all the amenities we could ask for. We would definitely like to go back! Also only 10 min from Canaan Ski resort which was perfect. This place was great! You do indeed need 4-wheel-drive to get up the hill. Game room is up a flight of stairs (it looks like it was built on as an addition) so it's still really quiet in the living room/kitchen/bedrooms. Hot tub was delightful, too. Definitely recommend this place! Spent Thanksgiving at Perfect 10. The property was nice, great setting, great views of the valley. Perfect size for our family gathering. We enjoyed our stay very much. The property was very family friendly.